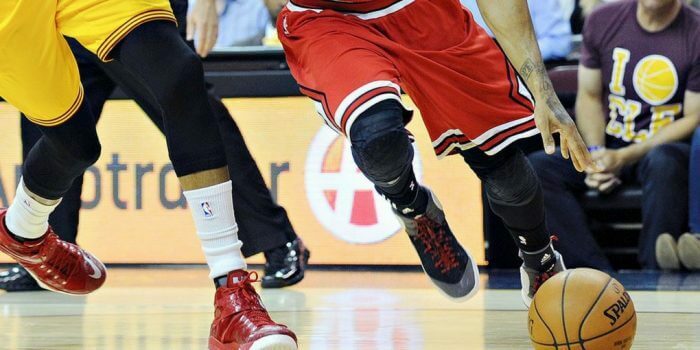 Watch any NBA game these days and take a look at the legs of the players. You will see very few naked knees! Everybody is wearing something: sleeves, braces, pads, pants. 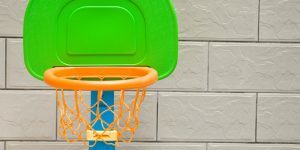 In a league where players have to battle through 82 games over a span of only 5 months, it is important to reduce the wear and tear as much as possible. Fortunately, all this gear is available to recreational players as well! In this article, I am going to help you find the knee pads, sleeves or braces that are best for each scenario. What’s the difference between pads, sleeves, and braces? If you want to protect your knees from damage, it is important to get the right gear. The following paragraphs will explain the differences between pads, sleeves and braces and show you when to use what. 1. Increases blood flow which helps recovery after a workout or basketball game. 2. Actively reduces pain during stress. Knee sleeves are especially useful if you want to prevent future injuries or want to reduce chronic pain in your knees. However, if you are recovering from serious injuries like an ACL tear, knee sleeves will not be enough. When it comes to protecting your knee from injuries, knee braces are a clear step up from simple sleeves. While knee sleeves mainly provide compression, knee braces increase the stability of your knees and provide the anterior knee and patella with external support. Sewn-in support stays help to increase knee stability – hinges eliminate dangerous hyperextension. Knee braces are most often used after injuries as part of the recovery process. 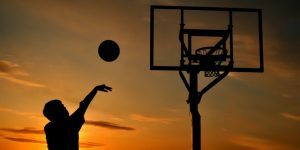 They help athletes prevent re-injuries and increase the confidence of recovering basketball players. If you want to buy a knee brace, make sure to talk to your doctor to get the right type for your specific injury. The purpose of knee pads is different from sleeves and braces. The main purpose of knee pads is not to prevent damage to the ligaments and tendons, but to soften external impact from opposing players or the floor. These pads have become very popular with basketball players in recent years, and allow players to attack with an added sense of security. In addition to providing compression, they also prevent floor burns and dampen the pain after banging knees with an opponent. 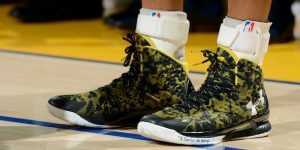 As such, they are a great piece of gear for basketball players with an attacking style similar to a young Derrick Rose or Russell Westbrook. A popular example of a knee pad is the McDavid 6446. Sleeves vs Braces vs Pads – What should you get? So what do you need in your specific case? If you have chronic pain in the knees, want to speed up recovery, or are looking for a slight increase in stability, go for knee sleeves. If you are coming off an injury to your ACL, MCL etc., go for a knee brace. Make sure to talk to a doctor to make sure you get the appropriate brace for your injury. However, if you are banging knees all the time and want to prevent knee contusions, go for knee pads. If you are looking for knee pads (or sleeves/braces), it is important to get the right size. If they don’t fit, then they don’t offer the protection you want! Now that you know what’s out there, let’s take a look at some of the best knee pads, braces and sleeves. 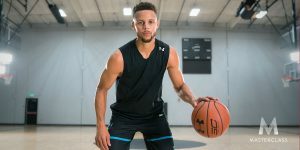 Made by the #1 company when it comes to basketball, the Nike Pro Combat knee sleeve will keep your muscles warm, compressed and ready for action. If you have chronic pain from patellar tendonitis or due to the excessive stress put on your knees, these knee sleeves can save you from a lot of discomfort. Plus they look really cool. Ariaprene material and strategically placed Mesh parts make the Nike Pro Combat sleeves very comfortable and breathable. If you are thinking about buying them and can’t try them on, consider going down a size because they tend to run large. 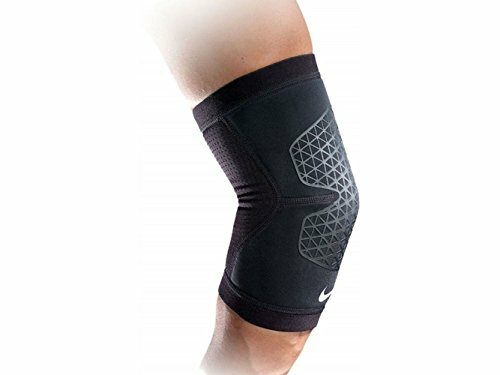 The Nike Pro Combat knee sleeves are a great choice if you are looking for good-looking knee wear that provides pain relief and moderate support. Shock Doctor is a company known for high-quality protective sports equipment. They offer a wide variety of knee sleeves ranging from simple and affordable sleeves to very expensive high-tech braces. The Shock Doctor 865 is an entry-level knee sleeve made from high-density Neoprene. In contrast to the Nike Combat Pro, it comes with an open patella that makes for a very comfortable fit and offers excellent freedom of movement. 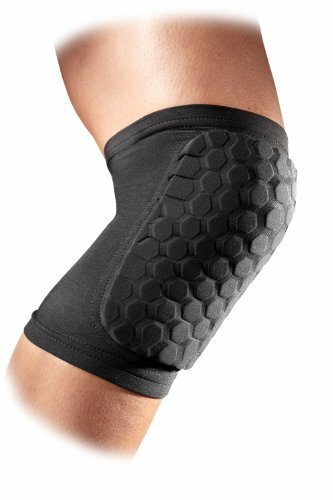 This knee sleeve works best for athletes who suffer from light to moderate pain due to arthritis, tendinitis or patellar alignment. If you are looking for support to relieve knee pain during and after games, but don’t want to restrict your mobility too much, then the Shock Doctor 865 is the right choice for you! Knee Pads are often referred to as padded knee sleeves, and with good reason. They combine the benefits of sleeves (compression) with padding that protects you from bangs and bruises. The McDavid 6440 is a light and comfortable knee pad designed to protect you from falls and collisions. It offers a surprising amount of cushion considering its thin design. Wearing a pair of these makes a ton of sense if you are the type of player that dives for balls or “sacrifices his body” for the team. I also like the fact that the McDavid 6440 ships in pairs – a great piece of equipment at an affordable price! Compared to the 6440, the McDavid 6446 is a larger leg sleeve that includes pads at the knees. This has two advantages: additional compression at the calves/thighs as well as better fit and less slippage. The functionality is the same. The pads protect you from bruises and provide you with additional confidence for reckless drives into the zone. If you are always giving 100%, diving to the floor and taking charges, these pads are a must. I recommend them over the McDavid 6440 because the price difference is tolerable and absolutely worth it as you get additional compression and a much-improved fit. Knee braces are the logical step up from simple knee sleeves. 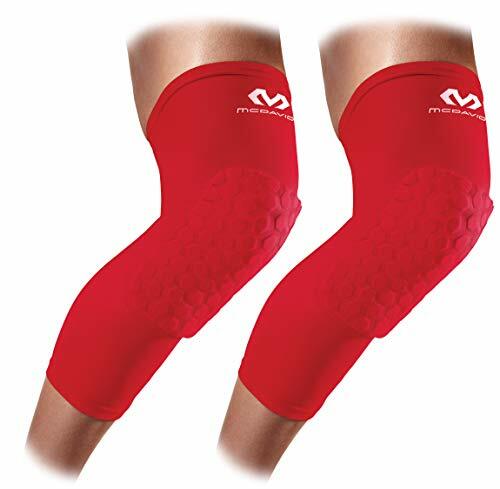 In addition to the compression supplied by sleeves, braces like the McDavid 429X provide excellent stability needed for athletes recovering from serious knee injuries such as ACL or MCL tears. 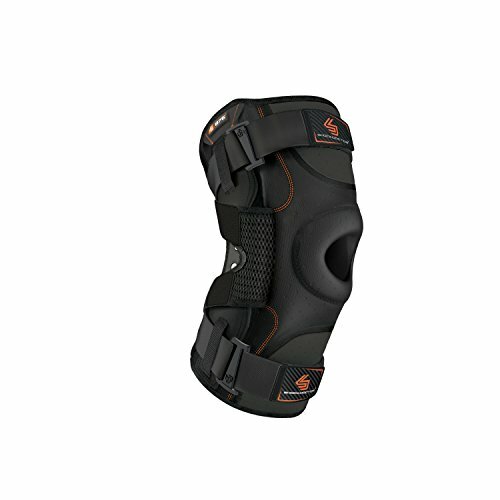 The steel hinges on both sides of this knee brace protect against excessive lateral movement and therefore help to stave off re-injuries to the side ligaments in the knee, mainly the MCL and LCL. 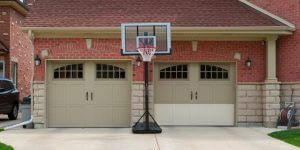 In addition, the hinges feature a stopper that prevents knees from hyper-extending. Putting on this knee brace is easy and shouldn’t take longer than a minute. Just slip it over your ankle, pull it up to the knee, then close the ligament X-straps in the front as well as the straps on the top and bottom and you’re ready for action! Compared to sleeves, the McDavid 429X brace is a lot bulkier, but if you are rehabbing from a serious injury, the added protection is absolutely worth the slightly decreased mobility! The 875 Ultra Knee brace is the most advanced knee brace produced by Shock Doctor. Its bilateral support hinges and tempered aluminum stays provide stability, protection and increased performance so you can hit the court with confidence! The Shock Doctor 875 requires a short break-in period, but after wearing it a few times, it gets really comfortable. It is a bit bulky so you will probably notice it during warm-ups. But after playing in it for a while, you almost forget you are wearing a brace. When you try it on for the first time, you will probably be pleasantly surprised by the insane support provided by the X-straps used on the back of this brace. They really lock you in tightly! 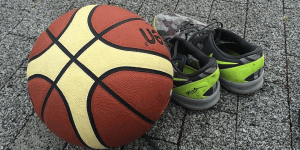 Overall, the Shock Doctor 875 is a very popular knee brace among rehabbing basketball players because it provides a lot of support while still being comfortable enough for long basketball sessions. If you are rehabbing a serious knee injury, talk to your doctor before you do anything. But, getting a knee brace like the Shock Doctor 875 (that increases stability and prevents unnatural movements) is a great protection against further injuries. 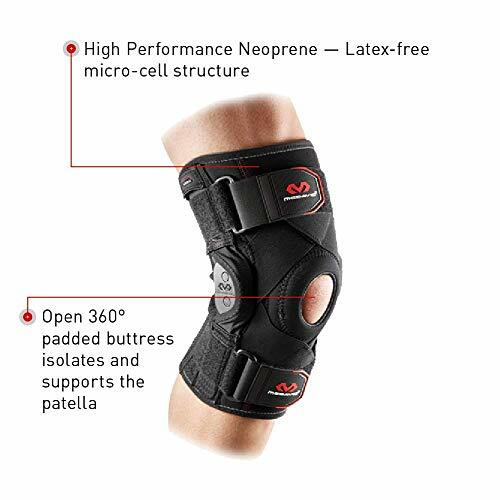 If your prime concern is knee pain during games, or if you want to protect yourself from bruises, I would advise you to get the McDavid 6446. 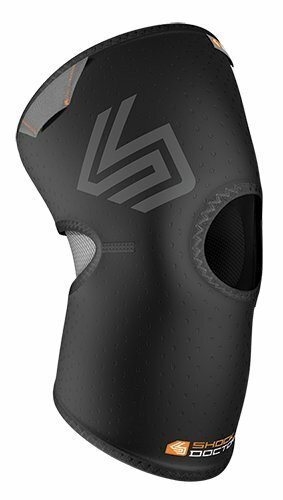 These knee pads combine the benefits of knee sleeves with additional padding and are a must-have for every basketball players that plays with reckless abandon.